While the U.K. Guardian‘s activist-journalist Suzanne Goldenberg bemoans the lack of mention of “climate change” in the recent US presidential debates, the new, improved Intergovernmental Panel on Climate Change (IPCC) appears to be continuing its standard operating procedure of … ignoring its own rules. […] the [recently “withdrawn”] Gergis reconstruction continues to be used in the IPCC Second Order Draft (released for review in early October) […] However, the attribution has changed. The First Order Draft attributed the reconstruction to Gergis et al (then submitted to Journal of Climate, later accepted and then withdrawn. See CA posts here). The Second Order Draft attributes the Gergis reconstruction to PAGES 2K Consortium (submitted to Science). How will the IPCC respond, one wonders? Recently, as Roger Pielke Jr. had observed, they declared that because their correction protocols do not cover Press Releases, there was no need to make any correction. I don’t recall reading anything in the IPCC’s conflict of interest guidelines regarding political candidacy and holding office within political parties, so perhaps Weaver’s choices do not concern the powers that be at the IPCC any more than they appear to concern Weaver. But I suppose that one might consider this non-concern to be in keeping with the IPCC’s practice of weighting its reports heavily by choosing a green-advocacy laden stable of authors, as Donna Laframboise has documented in her book, The Delinquent Teenager Who Was Mistaken for the World’s Top Climate Expert. Well, that settles it, then, doesn’t it?! With Suzuki on-side, it’s difficult to imagine that anyone at the IPCC would dare to suggest that Weaver’s deep-green political activities might compromise the “gold standard” output from their stable of “objective, transparent, inclusive talent”. 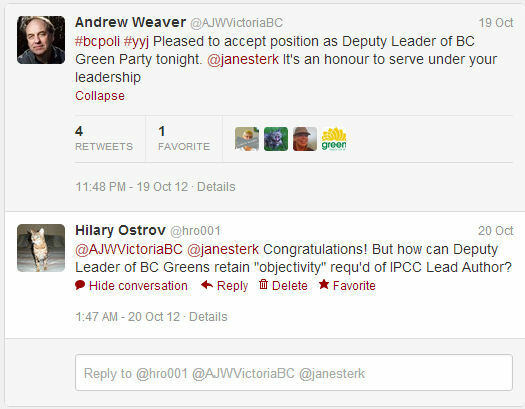 CBC censoring again – or honking for IPCC’s Andrew Weaver? In a supreme irony Smart meters are only necessary to combat the instability which intermittent “sustainable” wind and solar bring to the grid. 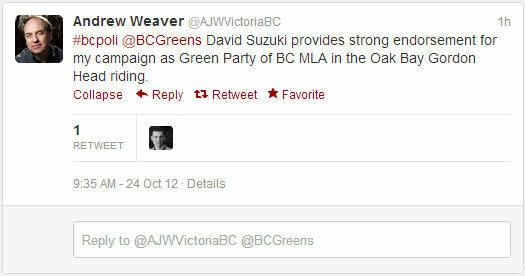 Just to keep the record straight, Betapug … Weaver is Deputy to Jane Sterk (leader of BC Greens since 2007, evidently), not Elizabeth May who is the lone green voice in Ottawa (albeit representing a green-tinted riding). Thanks for the clarification Hilary. Weaver and May are linked and seen together so often I assumed it was within the same branch (leaf?) of the organization. Havas and the Left’s opportunistic adoption of (literal) “tin foil hat” constituencies makes you wonder how strained the coherence with the “science based objectivity” meme can be. Dr. Havas does question wind turbines for their “stray electricity” emissions. On the other hand, David Suzuki’s, “we are all walking around with several pounds of plastic dissolved in our bodies” does show us that “Faith …is the evidence of things not seen”.